Expandable up to 5 daughter-boards. DC power socket – 2.1/5.5mm barrel jack. If you wish to power the RC2014 with 6v – 14v, there are pads for mounting a LM7805 regulator and capacitors to give a regulated 5v to the board. If you are using a regulated 5v supply, such as from a USB adapter,simply jumper across the 5v Direct pads. 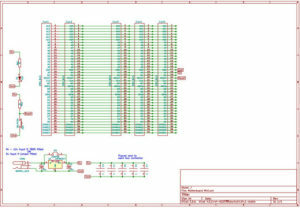 40 pin sockets – RC2014 modules typically uses 34 or 36 pins, but additional sockets are available for extended features. 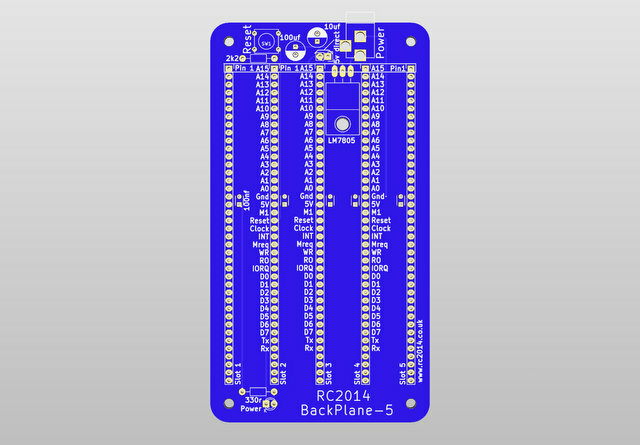 This backplane can be used to mount the 5 essential modules (CPU, ROM, RAM, Clock & Serial I/O) for a small neat RC2014. 5 straight 40 way sockets are supplied to enable this.